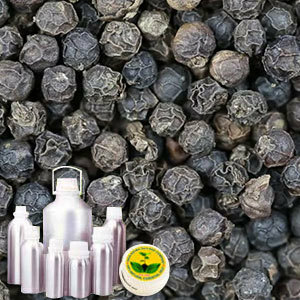 Black pepper spice oil is extracted from dried, fully grown yet unripe fruit of pepper plant, which is a perennial woody vine that has heart shaped leaves & small white flowers. It is highly beneficial when used during massage for easing aching muscles. 3% essential oil; 80% content of monoterpenes including sabinene, limonene, beta-pinene, terpinene, myrcene, alpha-pinene, delta-3-carene;monoterpene derivatives like carvone, borneol, carvacrol, linalool, 1,8-cineol; 20% of essential oil like beta-caryophyllene, beta-bisabolone, humulene, caryophyllene ketone. Rosemary, Marjoram, Thyme, Pine, Fir Needle Balsam, Lavender, Lemon, Other Spice Oils. It has wide variety of medicinal applications as well as is used as a stimulant to treat weak membranes like runny nose, hemorrhoids. Further, these are also used in ayurvedic medicines, as antidepressants, antioxidants, protecting cholesterol from changes leading to calcification as well as in the formation of atherosclerotic plaques.